On September 6. 1914. the military governor of Paris, General Joseph-Simon Gallieni, sought to extricate from France's choked rail system the Army's 7th Division. It was arriving from the frontier to join the 6th Army defending Paris. 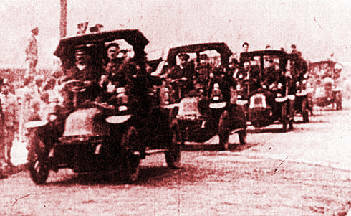 Told of a shortage of army motor vehicles and drivers, Gallieni said "Why not use taxis?" All Parisian taxis and their drivers were immediately assembled at the Esplanade des Invalides. "What about the fare," asked one of the taxi drivers. Compensation eventually did materialize at 27% of the meter reading. 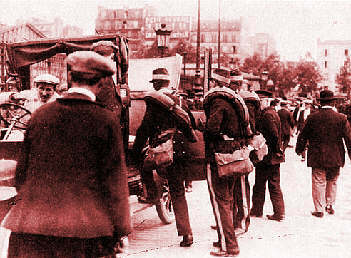 The lead column of about 150 empty taxis left Paris that night under a Lieutenant Lefas and went to Tremblay-les-Gonesses for further orders. 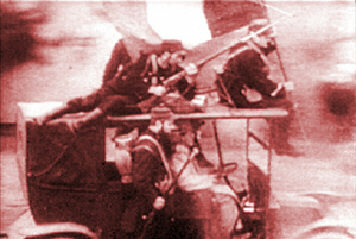 Advance was slow, breakdowns occurred, and no orders awaited him at the Tremblay, only puzzlement from the duty officer. About 4 am. on September 7 the expedition of now supplemented to over 400 vehicles was directed to Dammartin to await further orders from the 6th Army. In issuing rations to the taxi drivers it was a revelation that over twenty Frenchmen did not drink vine, and there was no water to be found. Patience prevailed at Dammartin while more empty taxis arrived from Paris. Finally the entire convoy, including stray trucks, limousines, and racing cars, drove to a rail siding to load the arriving infantrymen of the 103rd and 104th regiments. Departure for the front was at dusk. Soldiers tried to sleep and drivers strained to see the road without auto lights. Most of the cabs were sent back to take a second load. Each trip by a vehicle brought 5 soldiers close to the front ready for deployment. 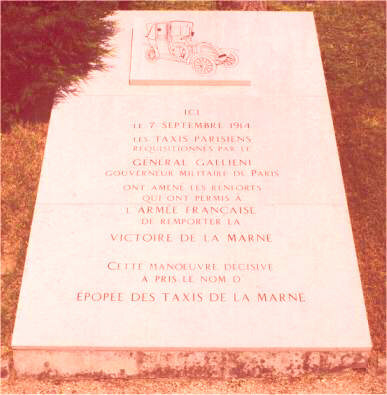 By September 8, two days after Gallieni had his brilliant idea, the taxis of the Marne had transported about 4000 badly needed soldiers to reinforce the 6th Army facing the Germans at the crucial point of battle near Nanteuil. With Paris saved, France had a new legend in the Taxi Cabs of the Marne showing its national ingenuity and determination. Later in the war, a parallel legend would develop around Verdun's Voie Sacre. 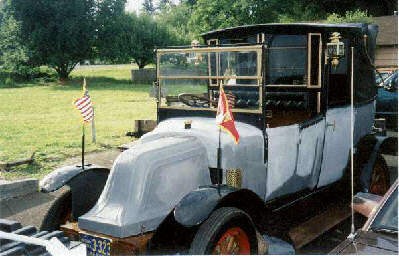 One of the last of the Maine taxis, an ancient, hearse-like vehicle with a tiny engine and a high, gawky body, can be visited at the Invalides Museum in Paris. Another is maintained in Portland, Oregon and is paraded on patriotic holidays. Additions and comments on these pages may be directed to: Michael E. Hanlon (medwardh@hotmail.com) regarding content, or to Mike Iavarone (mikei01@execpc.com) regarding form and function. Original artwork & copy; © 1998-2002, TGWS.